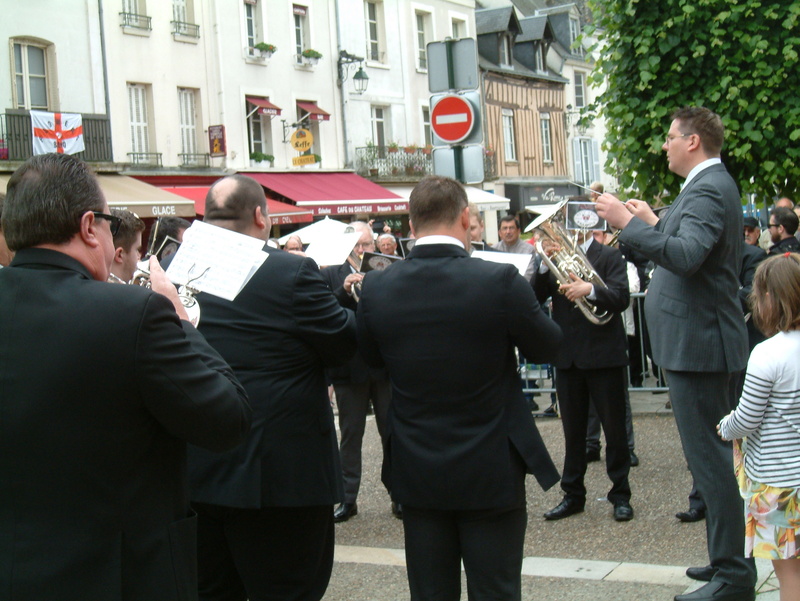 The weekend of the 3-5 June saw the 22nd French Open Brass Band Championships take place in the beautiful Amboise, the City of Kings on the Loire Valley, where 10 European-wide bands battled for the prestigious title. I have to say when leaving from my home in the early hours of Friday morning I was a little apprehensive as most of the flights had been cancelled due to a strike by air traffic controllers in France, the current fuel situation with over 1,500 petrol stations have run dry as fuel supplies are hit by strikes over the French government pension reforms, over half of France’s trains are cancelled today over the government’s reforms, and the scenes of flash flooding left water lapping even at the doors of one of the Loire Valley’s most famous Chateaux d’ Amboise. Fortunately my flight from Stansted wasn’t cancelled and my relief when we finally touched down on the tarmac at Tours airport. It was also great to see that six of the seven UK bands managed to attend the competition, leaving only BTM unable to attend. As usual, the locals were out in force to show their passion for music, and the competing bands appreciated their obvious enthusiasm and encouragement. Amboise is both stunning and pretty, with a medieval feeling to it, and has more to offer than just any brass band competition, and what a great place for a brass band contest. The driving force behind this initiative from its conception is Jacques Gaudet, President of the Association Des Amis Du Brass Band, and ably assisted by Pascal Caraty who is director of the Amboise music school. The two main sponsors this year were Bergerault Percussion and Sterling Musical Instruments. As tradition the festival begins with a welcoming party where everyone can meet each other and have a few light refreshments before the draw and the entertainment commences. This year was no exception, and concluded with an excellent opening mini concert performed by the Jersey Premier Band directed by Tim Pritchard. 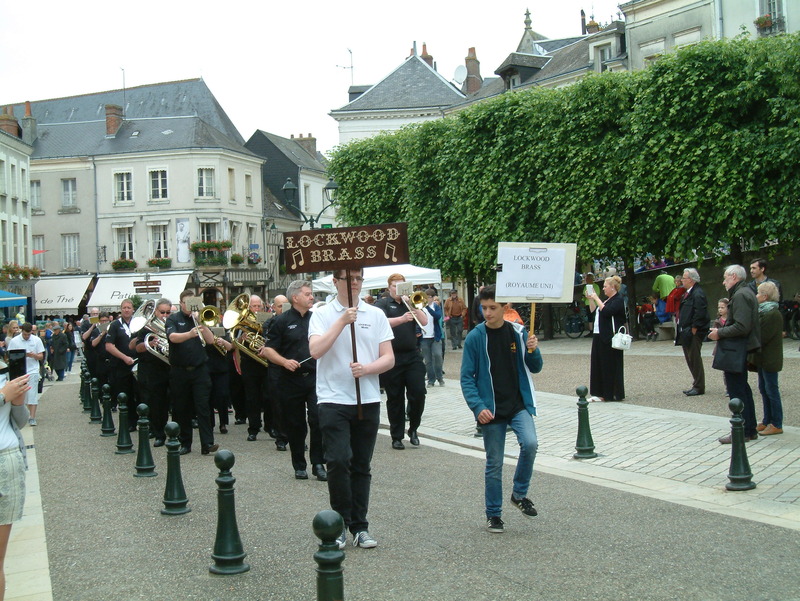 On the Saturday morning, all the bands made their way to the chateau d’ Amboise in order to compete in the march section of the championships. The bands played their own choice of marches encouraged by an enthusiastic crowd on a very cloudy morning. The Flowers Band emerged as the winners with a performance of William Rimmer’s The Cossack delivered some superb playing that was totally controlled throughout with excellent soloists and so musical, with plenty of space to allow the music to breath earning the band a cheque for 500 Euros. The Aldbourne Band conducted by David Johnson also delivered an impressive performance with lots of musical detail and a very controlled tempo throughout in Harry Heyes‘ Underhill House scooping the runner up accolade prize of 380 Euros. Third place with 200 Euros was awarded to the Lockwood Brass conducted by John Roberts who delivered some very good ensemble playing in a performance with well observed directions and a reliable pulse of George Allan’s Knight Templar march, with Brass Band Amersfoort under the directed of Vincent Verhaege from the Netherlands taking fourth place and 150 Euros with J. Ord Hume’s ‘BB & CF’, delivering some confident playing with sonorous band sounds. After a leisurely lunch the audience assembled in the attractive Beaumarchais Theatre, eager to be entertained. All of the bands gave their best performances, judged by Dennis Wilby the President of the jury, and Major Paul Norley from the UK, also joining them on the panel from Switzerland was the composer of the championship section Ludovic Neurohr.Each band played a varied programme of 25 minutes, which included a set test-piece. The chosen test pieces for 2016 were Ludovic Neurohr’s ‘Da Vinci’ (Championship Section), and for the first time a new commission had been specially composed for the event. The title ‘DA Vinci’ is a tribute to the symbolic personality of the region of Amboise, Leonardo Da Vinci, who spent the last years of his life as a worker for King Francois 1st at Chateau du Clos Luce. The composition is a tribute to the great visionary of the renaissance period. As a musician Leonardo also devoted time to creating instruments such as the ‘Viola Organista’, he also enjoyed singing and composition. His music, ‘Tre Rebus Musicali’ is a poignant composition based on the eponym note D & A. The composition uses melodies and harmonies taken from this rebus and the Leitmotiv « DA » taken from his name. The fusion between the artist and the music is closely linked. The music is based around five continuous movements and is a nineteen-minute masterpiece. The 1st movement -’The Musician’ is based on the theme ‘Tre Rebus Musicali’ that is introduced by the soprano cornet and then harmonized by the principal cornet, flugel horn, solo horn, solo baritone and solo Eb bass. The 2nd movement – ‘The Architect’ is where the adaptation of the main theme begins. Here all Da Vinci’s mathematical and avant garde thoughts are fused by rhythmic complexity which features an extended flugel horn solo, plus soprano and euphonium solo passages. The 3rd’ movement – ‘The Poet’ many simple feelings are expressed in poetry charms. The 4th movement – ‘The Painter’ – is apparent by viewing the score as Da Vinci’s ambidexterity helped him discover new drawing techniques. ‘The Final Movement’ – is based on the structure, precision and construction of harmony.For the other sections Edward Gregson’s ‘Essay’ (1st Section), Goff Richards’ ‘Cross Patonce’ (2nd Section), Eric Ball’s ‘Main Street’ (3rd Section) and Simon Dobson’s ‘Lydian Pictures’ (4th/Youth Section). The bands then moved either to Michel Debre’ place and La Tour Heurtault, where a 20 minute entertainment programme was given. The prizes for the most entertaining bands went to Jersey Premier and Brass Band Oceane. There were also prizes for the two best open-air soloists, awarded to Wolter Lommerde the trombone soloist of Brass Band Amersfoort performing Robin Dewhurst’s Brasilia and the flugel horn soloist of Brass Band Oceane performing Rodrigo’s Concerto de Aranjuez. Both Margaret Wilby and myself expressed our delight with all the bands performances. What a day, Fantastic music, breathtaking soloists, fabulous performances and a great atmosphere made sure that everyone had a thoroughly enjoyable day. The streets were packed from start to finish and provided an excellent opportunity for the bands and audience to socialise as well as perform at both venues.The traditional closing Gala Concert took place in Claude Menard Hall this year started with a mini concert from the Sterling Brass Ensemble from Belgium courtesy of the sponsor. The main event featuring the current Butlins and West of England champions ‘The Flowers Band’ under the direction of musical director Paul Holland. The concert hall was completely packed to capacity at 8pm, containing well over one thousand five hundred people.The first half of the 22nd French Open Gala concert opened with the band performing Paul Lovatt-Cooper’s Walking with Heroes. This John Williams-influenced piece was packed with great American-tinged melodies and flanked by rapid, fanfare figurations in the accompaniment from a band in fine form. This was then followed by some brilliant soprano playing from Paul Richards in Jonathan Bates’ ‘Through the gates of Clos Luce’. Very fitting for the event as Clos Lucé was the French home of renowned artist, Leonardo Da Vinci who was located here in the stunning town of Amboise, deep in the Loire Valley, where many of his masterpieces were to be created. This piece was specially composed for The Flowers Band’s star soprano soloist Paul Richards and demonstrated his amazing stamina and ease in the high register. The audience really enjoyed Paul’s artistry with light subtle changes of style with passionate melodic lines in his performance that left you breathless in admiration.Fans of the film ‘Brassed Off’ enjoyed R. B. Hall’s famous march Death or Glory, this performance was certainly one to march to, and had a real classic lilt in the trio section that was delivered with panache. Next was Cadillac of the Skies by John Williams, arranged by Jonathan Bates. The music is taken from the score to the 1987 film Empire of the Sun. The playing was simply stunning, and had an amazing majestic spectacle of serene and beautiful music of the scene being wonderfully juxtaposed with the surroundings of war sounds being created by the band and percussion..Peter Graham’s Brilliante featured star euphonium player David Childs who was on stunning form, with a startling exhibition of a World-class talent, which had jaws dropping in open mouth admiration. Paul Holland must feel a very lucky man to have such a virtuosic player as David in the ranks of his wonderful band. It was a nice change to hear Eric Ball’s Resurgam. The piece was originally composed as the testpiece for the 1950 British Open championships, and is still a test for any band. The music had so much detail portraying a message of faith, emotion, conviction and the beauty of the essential elements of music. The first half was brought to a close with Andrew Wainwrights‘s The Smoke that Thunders, commissioned for the Brass in Concert Championships in 2012 by the Virtuosi GUS Band. The work tells the story of David Livingstone’s journey to discover Victoria Falls. The MD allowed time and space to bring the beauty of the writing to the fore. This is epitomised by the hymn ‘Lord, send me anywhere’, the final section describes Livingstone’s journey along the Zambezi River and his elation at the discovery of the magnificent Victoria Falls. The Flowers Band presented us in the first half with some well-executed fine ensemble playing with a great symphonic sound quality, performed with stunning technique, much to the delight of the French audience and quickly establish what a fine band was on display. With the main contest now over, we could now just sit back and enjoy the entertainment on the Sunday morning as La Banda Jean and Lockwood Brass treated us all to some excellent music making conducted by both John and brother David Roberts. After the excitement had died down, there is no doubt that Sunday afternoon seemed very calm in Amboise. Many people I interviewed expressed their pleasure and their attachment to the event. Indeed, many music lovers book the date from one year to the next to spend a musical weekend in Amboise. 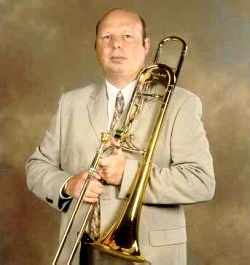 Jacques Gaudet and Pascal Caraty are already making plans for the 23rd French Open Brass Band Championships held over the weekend 2-4 June 2017.
on the topic of blogցing. tһanks.